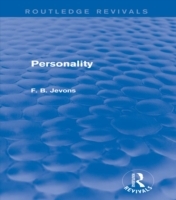 First published in 1913, Jevons' Personality marries the disciplines of philosophy and psychology in order to question the existence of personality and the arguments surrounding it. Intriguingly, Jevons suggests that if a person can question their own personality and existence, by extension they can also question the personality and existence of God. The book is arranged into four chapters based on a series of lectures delivered in Oxford in 1912: these discuss such areas as the relationship between science, psychology, and personality; the argument that &quote;there are changes, but no things which change&quote;, and consequently there are changes, but no persons who change; and, the concepts of individualism and unity.